You Don’t Know Jack has always been an innovative property. The very first YDKJ game in 1995 was one of the first titles to take full advantage of the storage space offered by then-new CD-ROM technology, and there’s been plenty of experimentation since then. In addition to frequent physical releases, YDKJ‘s developers put out a daily online version in the internet’s infancy; something I enjoyed playing in between games of Acrophobia many years ago. There was even a brief live action version of the game show hosted by Paul Reubens, trying to capitalize on the popularity of Who Wants to Be a Millionaire? More recently, there were daily updates for a mobile app and Facebook versions of the game, but support for these ended in 2015. Since 2014, You Don’t Know Jack‘s developers have been taking advantage of the ubiquity of smartphones by allowing players to use their phones or other internet-enabled touchscreen devices as controllers. 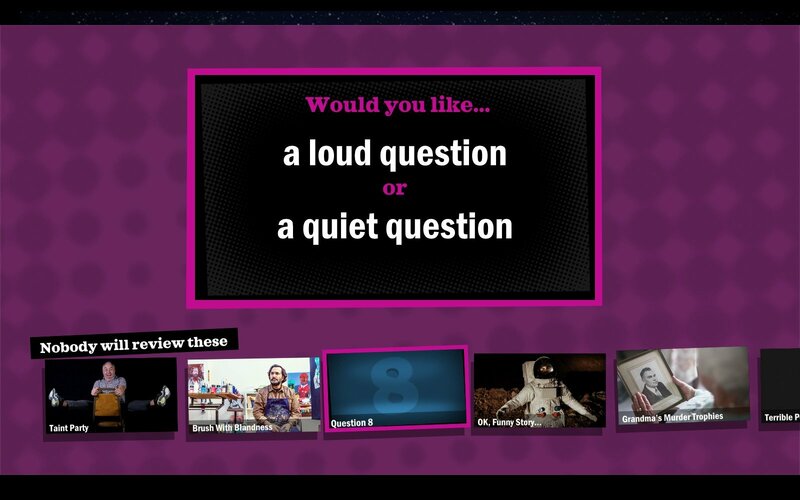 Every Jackbox Party Pack includes five different multiplayer games with simple controls, and that support local play or can be shared with a worldwide audience using Twitch. Other developers have tried to borrow these mechanics (looking at you, That’s You! and Use Your Words), but so far, no one has surpassed Jackbox at their own game. This year’s Party Pack is the fifth collection of low-entry barrier social games. So how does it compare with its predecessors? This year’s Jackbox Party Pack includes five brand-new games to play with a group, with some extra features for players who plan to stream on services like Twitch or Mixer. This Party Pack‘s social features have been expanded to allow up to 10,000 viewers to participate as part of the audience, influencing votes and making their mark on the proceedings in a variety of other ways. All games except You Don’t Know Jack: Full Stream offer a family-friendly mode, and all five games include some other tools to make them easier to share on streaming services. Most games need at least two people to play, and the majority in this pack require three or more. Most work even better if you have more players, and all of them seem to be the most fun with a full complement of six to eight players. I’ll go over each game in turn, but I’ll start by saying I was pleasantly surprised not to see any clunkers in the pack this year. Previous Party Packs have all had one or more returning games, but the only returner this time is a new version of the game that started it all. In addition to a new version of You Don’t Know Jack, four new games make their first appearance in this Pack: Split the Room, Mad Verse City, Zeeple Dome,and Patently Stupid. Let’s start with You Don’t Know Jack: Full Stream. For those new to the series, YDKJ is an irreverent trivia quiz show where the host makes no attempt to hide his disdain for the players, and the questions combine pop culture with historical and literary references. It’s been ably hosted since the third CD game by Tom Gottlieb under the pseudonym Cookie Masterson. This is the first YDKJ title released since the very first Party Pack in 2014, and my group found it to be a welcome return, especially with the upgrades since the last time it made an appearance. The main game can be played solo or with up to eight players at once, and the audience can participate in this version by answering questions right along with the players. This even has an effect on the gameplay, since audience members who whiff questions players get right will offer up some bonus cash. Each game consists of ten questions plus a final “Jack Attack” round where you have to match up several people or things according to a hint onscreen. This time, more than one answer can be correct, and players can earn (or lose) extra money if they answer these questions quickly. Each game also includes a “Dis or Dat” round which sees you categorizing two things that aren’t as different as you might think, and may have some other types like a “Gibberish Question” where the rhyming syllables are more important than the words. A couple of new question types join the party as well; “Player’s Choice” lets the group vote on what type of question they want to see (though the results are rarely what you think they’ll be), and “Data Mining” takes user polls into consideration. The framing device involves a benignly evil Netflix-like company called “Binjpipe” which has taken over the You Don’t Know Jack studios and seems to have designs on the rest of the media landscape. Fortunately, this hasn’t affected the after-show commercials the series is known for, and it’s worth sticking around after the show to listen to a few before starting a new round. One thing to be aware of is that the game no longer supports mouse and keyboard controls, (or, presumably, controller input on console versions) and you must use a touch device or log onto jackbox.tv in a browser window to play. It’s not a huge deal, but I briefly confused myself a couple of times by trying to click on an answer onscreen rather than in my browser window when I played a couple of rounds by myself. Midway through each game, players who are lagging behind earn the opportunity to stick it to their opponents by Screwing them. This hardware is especially entertaining now that everything is handled on your small screen, and several creative impediments to entering your answer can be used against you if you don’t answer quickly. For example, a Screwed player might have to read the answers without any vowels, or might have to scroll through a lengthy EULA before being allowed to answer the question on the main screen. While many games in previous Party Packs have tasked players with getting as many votes as possible, Split the Room is a game about being divisive. Three to eight players are presented with a hypothetical scenario with a single element left blank. Their job is to complete this scenario as contentiously as possible, trying to cause a 50/50 split in how the other players answer the prompt. Points are awarded based on how cleanly you manage to divide your fellow players’ answers, with bonus points up for grabs if it takes them a long time to decide how to answer. The final round provides a partial scenario that you have to provide an alternative to, and offers a chance for more points if you correctly predict the intentions of one of the other players. The host of this game is a deadpan cat in a business suit who seems to be patterned after Rod Serling on The Twilight Zone. This character is very well animated, and my group enjoyed seeing the different ways he morphed while waiting for other players to enter their answers. The prompts lend themselves well to being as silly or thought-provoking as you like, and it can be genuinely difficult to read the room and create a scenario that will cleave your group in twain. It’s easier with a group that have known each other for years, so newcomers to a particular party may be at a slight disadvantage with this one. My group enjoyed this one just as much as I did, though one player said she’d have preferred if the answers would remain anonymous instead of revealing who wrote them at the end of the round. I didn’t think this hurt the game at all, but I can see how it might keep people from writing ridiculous or depraved scenarios. However you play it, Split the Room is an entertaining psychological experiment that works best when you correctly read your audience of fellow players. 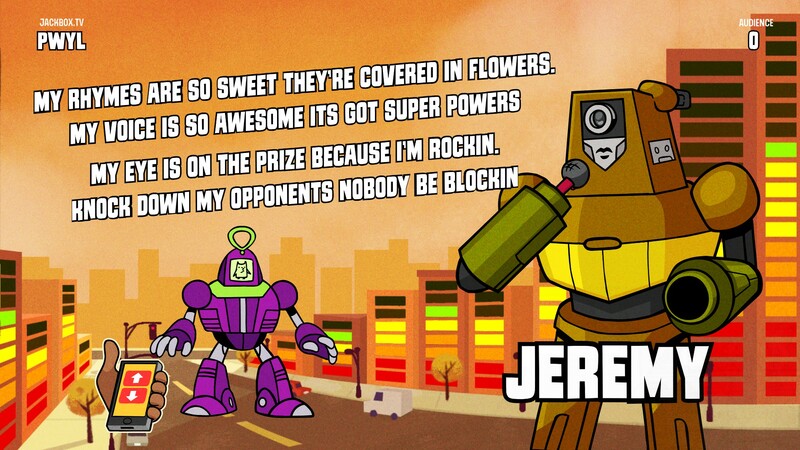 On a totally different part of the spectrum is Mad Verse City, a game about giant, rap-battlin’ robots. This one is a different sort of fun, encouraging up to eight players to write their own diss tracks about someone else in the room and see them performed by a fifty-foot automaton. It’s a little like Mad Libs meets Transformers meets 8 Mile, and the results are sillier than even that description probably makes them sound. At the beginning of every round, each player is told to provide a certain type of word, like a noun or verb. They’re then provided with the first line of a disrespectful rap song and are told to write the next line however they want. You don’t have to make it rhyme or even make sense, but the game works a lot better when you do. This is repeated to make a four-line poem disparaging one of the other players, and once everyone’s done players can vote on who they think got served the worst. You can also cheer or boo midway through a rap if you thought a particular line was phat or wack. Each player is represented by a robot who’s built out of a piece of defunct technology, and your avatar might be based on a camcorder, Tamagotchi, or VHS tape. What’s more, all of the robots have a unique voice provided by an intentionally bad vocoder. It’s pretty funny listening to a passionless robot voice spitting hot fire at its adversary, though I found the humor of the gimmick wore off fairly quickly. How much you get out of this one will largely depend on how good your group is at tailoring their disses to their opponents within the time allotted. There were a couple of things about this one that could have been handled better. Mad Verse City requires an even number of players since every rap battle pits two combatants against one another. If you have an odd number of players, Gene the generic robot fills in and raps once during every round. I understand that this is probably better than some players having a bye round, but Gene’s raps are usually pretty bad, and for some reason the computer player gets to vote on all of the other face-offs. One other complaint regards the hosts. For the most part they do a good job of explaining the scenario and pumping up the crowd, but they can be extremely distracting, especially when they start talking in the middle of the lyric writing phase. It’s hard enough to think of a good rhyme even without someone yakking in your ear, and during one session they were talking for about a third of the allotted time. Fortunately, we discovered that we could add extra time to the writing phase in the options menu, a feature intended for streaming but which I’d recommend turning on for everyone. Even without the extended timer there’s a lot of downtime for audience members or early finishers, but they can amuse themselves by repeatedly clicking to help the robots destroy the city in between rap battles. Mad Verse City may not be what your group is looking for, but I had a lot of fun with this one. Still, insulting other players isn’t for everyone. It’s a more situational game, and may not be appropriate if the players don’t know one another very well. And now for something completely different. Zeeple Dome is the first action game ever included in a Party Pack, and plays something like a simultaneous multiplayer version of Angry Birds. You can play this one by yourself or add up to five friends, working together to defeat waves of multicolored aliens. Every player controls a different colored astronaut character and can fling them around the main screen by dragging their finger on their touchscreen, using it sort of like a catapult. 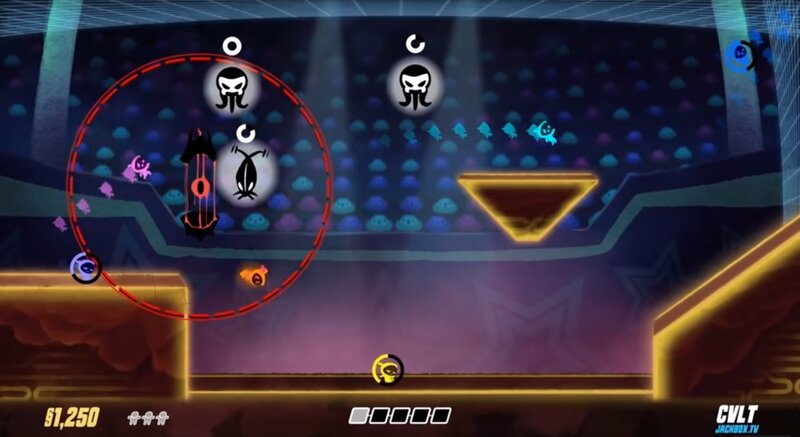 Hitting the sides or top of the arena causes your character to rebound, and there are always several fixed obstacles in an arena to contend with that cause the same reaction. Several types of aliens appear at random points on the main screen, and the object is to clear them by crashing into all of them repeatedly to progress to the next round. Unfortunately, the aliens can’t be defeated unless their color matches yours, and they move around and counterattack if they’re left alone for very long. When more than a few players are participating, this one gets very chaotic very quickly, especially since players can crash into one another midair and screw up one another’s trajectories. It seems to work best when you talk things out with other players, calling out aliens that match their color and letting other players know when you’re about to fling yourself at an enemy. The audio in this one has some high points and some low ones. The announcer has a little too much reverb on his voice to be intelligible, and we couldn’t really understand what he was saying during a majority of the game. On the other hand, the gibberish-lyric music reminded me of some of my favorite tracks from Splatoon, and the grunts and squeaks of the little earthlings can be pretty entertaining. I enjoyed this one more than I thought I would, but we did run into some tech issues during our second game. One player’s phone stopped responding, and his avatar had to stand there not doing anything and absorbing enemy attacks. Players can resurrect one another by flying near a departed buddy, but since aliens can’t be destroyed if they’re the wrong color, this player was effectively dead weight. We also ran into some issues because some of the colors are very similar, and a couple of the players had trouble distinguishing between the pink and purple avatars, as well as the yellow and orange. Finally, we have this year’s drawing game. Patently Stupid puts three to eight players together in an invention seminar, and the idea is to create a silly invention to solve a ridiculous problem. Each player is given a pair of fill-in-the-blank prompts describing an unusual problem which will be given to another player. That player has to decide which problem to solve, then design and draw a product intended to fix the issue. That’s not all though, because you still need to give this product a name and a tagline to help it sell. Once all this is done you can choose to present your invention to the rest of the room, or let the hosts do the heavy lifting for you. Once everyone has made their pitches, the final round begins, where each player votes for their favorite inventions. Votes carry a monetary bonus, and the goal of this round is to achieve a funding target which will allow your invention to enter production. If that sounds like a lot of steps, that’s because it is. It’s sort of fun, and the cheesy hosts do their best to elevate the material, but there’s not really anything here to recommend over previous Party Pack drawing games like Drawful 2 or the gold standard, Tee K. O. There were a couple of other things that keep me from giving Patently Stupid a full recommendation. I think it’s a little too easy to ice other players by intentionally providing terrible prompts at the beginning, and I wasn’t thrilled to see Gene the generic guy make another appearance. I’d like to give this one another shot with another group of players to see if it might work better under different circumstances, but for now I think we’ll probably be sticking with some of the other games in the pack over this one. To summarize, I thought Split the Room and You Don’t Know Jack: Full Stream were worth the price of admission all on their own, and Mad Verse City and Zeeple Dome can also provide a substantial amount of entertainment value. I’d like to give it another chance, but my first impressions of Patently Stupid weren’t as encouraging. 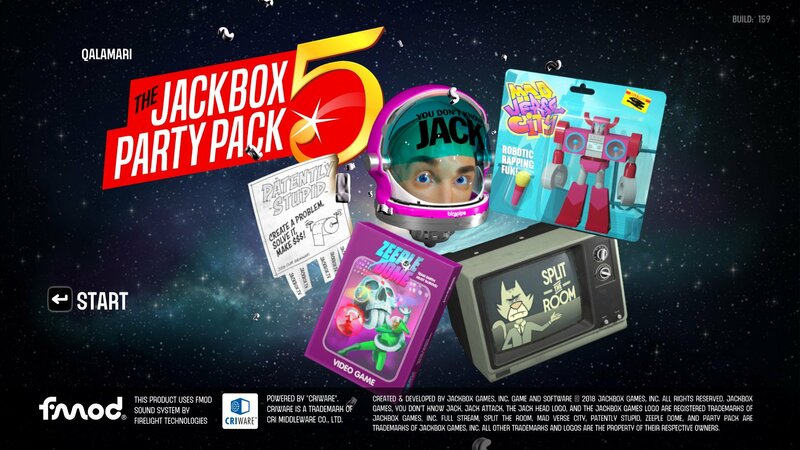 It’s not quite as good a package as my favorite Jackbox Party Pack, but in my opinion, Party Pack 5 is much better than last year’s offering. None of the games seem to be here just to fill out the pack. If you’re looking for something to do with a group over the upcoming holidays, there’s plenty in Party Pack 5 to keep a whole bunch of people engaged and laughing for hours.